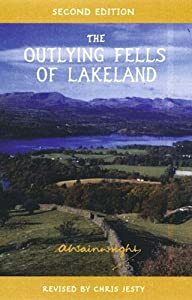 A few years after completing his Pictorial Guides to the Lakeland Fells Wainwright added this one on the Outlying Fells which he said would be of help to those whose limbs were no longer capable of the more demanding walks. Click here to see the other 2nd edition Pictorial Guides individual copies or here for the boxed set. The Outlying Fells of Lakeland revised edition of Wainwright's selection of 56 Lakeland 'foothills' not included in his main Pictorial Guides, all but one (Humphrey Head) within the boundaries of the National Park. Vintage Wainwright, full of eloquence and humour, brilliantly updated by Chris Jesty.